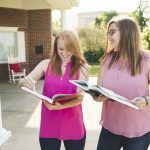 The Alpha Sigma Alpha Alumnae Book Club is a space for members to connect through a shared passion for reading. Each month, Alpha Sigma Alpha will announce a selected reading and a “live” book discussion will take place on the second Wednesday of the month at 8 p.m. ET. Learn more about the Alpha Sigma Alpha Alumnae Book Club by reading the FAQ. Live discussion Wednesday, March 13 at 8 p.m.
Live discussion Wednesday, April 10 at 8 p.m.
To recommend a future monthly book selection, email the Director of Alumnae Engagement Vanessa David at vdavid@alphasigmaalpha.org with the book title, author, description, and reasoning why the book would be a good choice for the book club.